Call, visit, email anytime - we'd love to hear from you. "We want to thank you so much for the beautiful Scrub Tub that you made that is now a beautiful featured part of our garden. I love that you both made it yourselves, and the fact that the timber and iron is from your farm. My favourite part is the your beautiful wedding china that you put into the hypertufa tub, it's so very special. I hope it brings us the same long marriage! I will think of that everytime I use the scrub tub. Thank you again for your wonderful creativity, and for kindly helping us place it in our garden. We hope to see you again!" 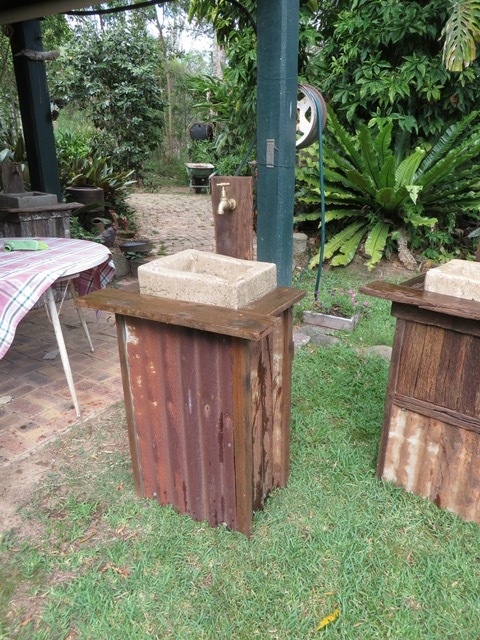 "To the clever people that have hand crafted concrete sinks and recycled old timber and iron and 'upcycled' these into Tuchekoi Tubs, congratulations. What an amazing and practical addition to my garden. My Tuchekoi Tub sits cosily in my garden and is in regular use as I wash my harvested vegetables and my hands after a day in the garden. Well done". "Initially I was inspired by the creativity plus the simplicity of the plumbing connection. It is a stunning blend between functionality and rustic beauty. I love the shell and broken crockery insets in the tub. I had to buy it straight away". "I saw the Tuchekoi Tub as a unique addition to my garden. It fits perfectly into my vegie garden and is so useful for washing vegies and hands before going inside". Hello, we are Adrienne and Paul McVerry, a creative and industrious couple living in the Sunshine Coast Hinterland at Tuchekoi, Queensland. Our tubs are individually handcrafted rustic bowls, with recycled hardwood or corrugated iron cladding on solid hardwood timber frame, or painted, treated plantation pine on hardwood frame. The bowls have added organic products in the mix, for a more individual look. The brass tap can connect straight to the garden hose, or can be plumbed into the mains water, with the waste feeding straight back into the garden, or existing grey water storage. Tuchekoi Tubs: are made from recycled materials with handcrafted bowls and brass tap ready for connection to plumbing or garden hose. There are 3 finish styles available on a solid hardwood timber frame.